Section 59 of the Probate Code allows anyone who is at least 18 years old to make a will, if he is of sound mind. The granter of the will should sign it in the presence of two independent witnesses, who should also sign. The witnesses must be older than 14 years and should not be beneficiaries under the will. A notary public is authorized by the state to administer oaths and certify official documents, including wills. Any Texas resident who is 18 years or over may apply to become a notary public, if he has no serious criminal convictions. Each notary public must maintain a record book, listing the date of each document notarized, the name of the signatory and details of the witnesses. Anyone signing a document before a notary public must appear in person. 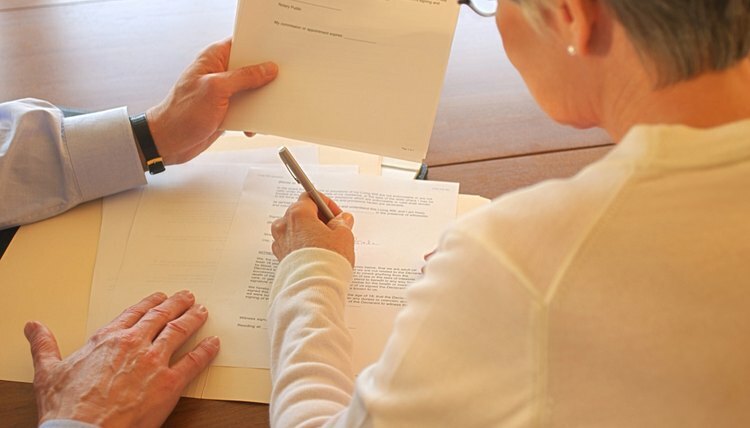 Section 59 of the Texas Probate Code provides a form of affidavit, or sworn statement, to be completed by a notary public when notarizing a will. The granter of the will must declare to the notary public, in the presence of his two witnesses, that he willingly signed the will, that he is 18 years or over and that he is in sound mind. The witnesses also declare that they signed as witnesses to the will. The notary public then signs the affidavit and attaches his official seal. The affidavit should be attached to the will so that it can be easily found on the granter's death. The granter can arrange for notarization at any time before he dies.